This AMTA/NWMOA Joint Technology Transfer Workshop will focus on membrane-based technologies. Attendees will learn about the different ways membranes are improving water of the Northwest Rivers and the cutting edge applications of membrane technologies. Topics covered include a deep dive into membrane technology, next level phosphorus treatment with UF, Big Sky MBR procurement, ceramic membranes, membrane operations optimization, data driven decision making, and quality control in membrane manufacturing. The workshop will include membrane technology expo, presentations on membrane technologies, and a plant tour of the Simplot Potato Process Water Treatment and Return Plant. Please check back soon for more information and registration for this event. 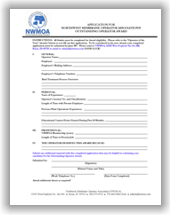 It is time to nominate your favorite Operators and Plants for the Northwest Membrane Operator Association’s “Operator of the Year” and “Plant of the Year” Awards. To nominate or be considered for this year’s award, please complete the application and submit by May 17, 2019. Please click the provided links below for the award criteria, application and instructions. 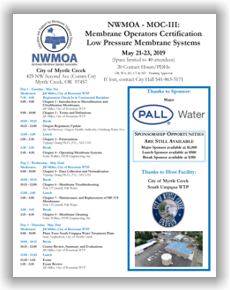 If you are interested in entering the 2019 Best Tasting Membrane Water Competition please submit a completed entry form to NWMOA by Friday, June 28, 2019.